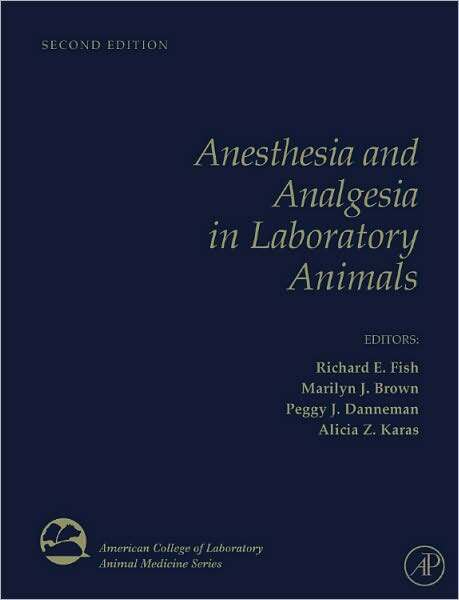 Anesthesia and Analgesia in Laboratory Animals, 2nd ed. Notice: This is an old thread. The last post was 2540 days ago. If your post is not directly related to this discussion please consider making a new thread. Thread: Anesthesia and Analgesia in Laboratory Animals, 2nd ed. Since the publication of the first edition, interest in the field has continued to rise, most notably in pain management. Anesthesia and Analgesia in Laboratory Animals focuses on the special anesthetic, analgesic, and post-operative care requirements associated with experimental surgery. Fully revised and updated this new edition provides the reader with agents, methods, and techniques for anesthesia and analgesia that ensure humane and successful procedural outcomes. * New to this edition - Section IV now includes chapters on ferrets, birds, reptiles, amphibians, fish, and invertebrates. Last edited by Motoko; 2nd April 2017 at 04:37 PM. Reason: ADD INFO, IMAGE, DESCRIPTION. TEMPLATE. MAKE POST. Re: Anesthesia and Analgesia in Laboratory Animals, 2nd ed. Last edited by Motoko; 23rd October 2017 at 01:25 AM. Reason: UPDATE.